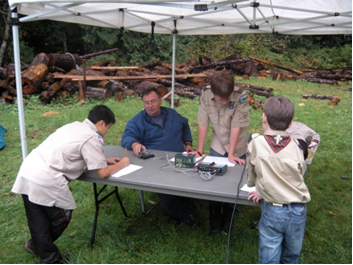 Snohomish County Hams Club assists the local Boy Scouts with JOTA yearly in October. All are welcome to assist each year. This allows the scouts the opportunity to make the necessary contacts for those that are after their HAM merit badge. 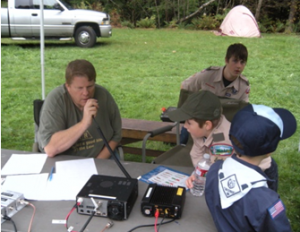 This annual world-wide scouting amateur radio operating event will occur over the weekend of October 21-22, 2017. Troop 41 and the Washington State Scouting ARC, WA7BSA, invite members of the Snohomish County Hams Club to consider participating in this event on October 21st. This JOTA will take place at Camp Freeman, which is east of Lake Roesiger, and on the opposite side of the Monroe Camp Road from the entrance into Camp Edward (map will be sent to volunteers). You may set up an HF station and operate; you may come with HT to assist with making 2M contacts for the scouts; or you may come as a visitor and see what JOTA is all about. If you think you would like to participate, please contact Tom Hutchinson, N7PKK, at (425) 252-0890 or email to n7pkk@arrl.net for more details. Below are pictures taken during JOTA – 2013.